Often films are driven as much by their scores as their soundtracks, or vice-versa. Typically, a record company releases one or the other to the public, occasionally releasing both if the audience is there and if the music is worthy. At times, such releases will be score/soundtrack compilations, something of a “best of” collection of “music from the major motion picture…” though they are usually just released as two separate albums – one for audiophiles who enjoy scores (or for a broader audience if the music is exceptionally memorable – such as Howard Shore’s unforgettable score for The Lord of the Rings trilogy or Hans Zimmer’s oft-copied work on Gladiator) and one soundtrack album for audience members who hear a music track in a movie and can’t get it out of their mind.Â In the curious case of The Curious of Benjamin Button, the music from the movie has been released in an impressive double-disc set – one for Alexandre Desplat’s moving score and one for the various tracks that make up the rest of the film’s musical landscape. French composer Alexandre Desplat was first brought to the forefront of film composition with his 2006 Oscar nomination for the score of The Queen. Since then he has scored such films as The Golden Compass, The Painted Veil, and Terrence Mallick’s upcoming Tree of Life. 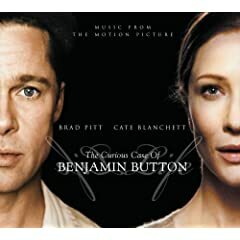 His score for The Curious Case of Benjamin Button, which comprises the first disc of this beautifully packaged two-disc set, should line him up solidly for his second Oscar nomination. From the action-filled tracks “Mr. Button” (a piece that travels along at a clippy, rattling pace) and “Submarine Attack” (a track that would feel at home in the soundtrack of any decent thriller), to the more reserved and hopeful piano-driven “Mr. Gateau” and the quietly unnerving “The Hummingbird” (where the instruments are played gently and cautiously, slowly building to a final high-pitched note that caps the track off), Alexandre Desplat’s Golden Globe nominated (and most-likely soon-to-be Oscar-nominated) score covers a range of emotions as wide and diverse as David Fincher’s two hour and 45 minute epic covers – and it should, considering it provides a good dealof the musical backdrop for the film. The track “A New Life” sounds almost Danny Elfman-ish, with driving, upbeat string progressions that somehow come off slightly unnerving while “Dying Away” is a contemplative expression of emotional piano intermingling with strings. The second disc in this collection is a soundtrack disc, interspersed throughout with short quotes excerpted directly from the film (mostly Benjamin narrating, though occasionally he’s talking to another character). Though this format often works in soundtracks, it falls a little bit flat here. I’m not sure if it’s a matter of poorly selected quotes, if the break from the music is just odd, or if Brad Pitt’s accent feels too unnatural in short blips (it works better when absorbed over nearly three hours of film). The musical tracks are more enjoyable, with a collection of jazzy, big-band era tracks (“We Shall Walk Through the Streets of the City” and “That’s How Rhythm Was Born” are fine examples of these), bluesy songs (the obviously titled “Freight Train Blues” and “Basin Street Blues” as well as the horn-led “Out of Nowhere” are some of the best on the album), a classical piece (“Arabeske For Piano In C Major Op. 18” – odd for a soundtrack…), and a few Louis Armstrong tracks thrown in for good measure. It’s a relatively relaxing mix of music, though not quite as impressive as Desplat’s score. Randy Kerber’s “Bethena (A Concert Waltz)” is the last album on the track, and with his expressive piano, he brings almost two hours of music to a beautiful close. No user commented in " Music Review: Music From The Motion Picture The Curious Case of Benjamin Button, score by Alexandre Desplat "